A bolt of lighting stuck the roof of Oak Meadow Golf Club three weeks ago where the 2009 National Fitness Hall of Fame Induction Ceremony & 4th Annual “Don of Sports” Awards Dinner were to be held. Two weeks later, another metaphoric “Bolt of Lightning” was felt amongst an “Electrified Crowd” at the Glendale Lakes Golf Club which, on short notice, was able to host to this special event. A capacity crowd (200+) was on hand at the Glendale Lakes GC to experience this fantastic event as legendary sports broadcaster Don; “The Don of Sports” Figarelli handled the MC duties. Don has the unique able of blending wit and humor with warm and sincerity to make everyone feel great! This year three Addison residents, Mike Hartnett, Dean Stathopoulos and Jerry Catanese received the coveted “Don of Sports” Award, all of whom were surrounded by loving family and friends. The “Don of Sports” Award recognizes those individuals who have dedicated time and service to the community and demonstrated outstanding sportsmanship. 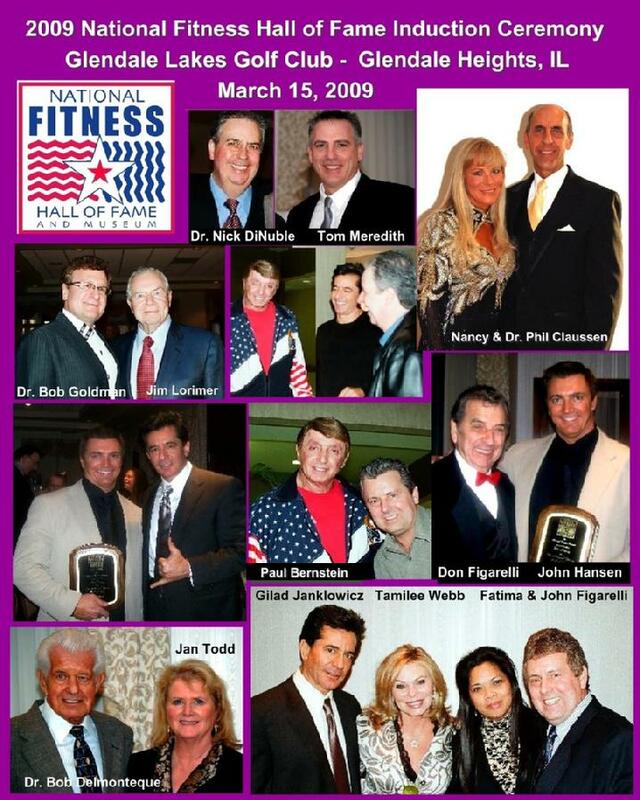 For more than 30 years, Don Figarelli has been the voice of sports and fitness in Addison and the surrounding communities through his award winning cable television show, broadcasted on Comcast Cable, and his popular radio program, aired on superstation, WJJG 1530-AM, seen and heard by the tens of thousands of fans! The presentation of the “Don of Sports” Awards is one way that Don gives back to those terrific people who have helped him throughout the many years. The following individuals were on hand to receive the Hall of Fame induction honor: Paul Bernstein, Nancy Claussen, Dr. Philip E. Claussen, DC, Dr. Nicholas A. DiNubile, MD, John Hansen, Jim Lorimer and Jan Todd, Ph.D. Nicki Anderson accepted on behalf of the organization, IDEA Health & Fitness Association and the late Joe Bonomo was honored, posthumously as a pioneer of fitness. These professionals have dedicated their lives in the service of others and have helped millions get fit, stay in shape and live healthy, happy and productive lives. Past Hall of Fame Inductees, Dr. Bob Goldman and Tamilee Webb co-hosted the NFHOF event and helped present the Hall of Fame’s first ever, “Lifetime Achievement Award” to Dr. Bob Delmonteque. Dr. Bob who was born on November 9, 1919 is known as America's premier senior fitness consultant. Two special awards were presented by the Hall of Fame: The “Volunteer of the Year” and “Rising Star of the Year” Awards were presented to Bartlett’s, Tom Meredith and Naperville's Betty Scarimbolo respectively. Some other past Hall of Fame Inductees who participated in this year’s festivities included Bob Gajda, Dr. James Stoxen, Gilad Janklowicz and representing the American College of Sports Medicine, Jim Whitehead.